FLIR's A655sc infrared cameras offer ultra-sharp 640 x 480 image resolution, high-speed windowing for an increased output frame rate up to 200 Hz, Gigabit Ethernet and USB connectivity, filtering, and the best sensitivity in an uncooled sensor. 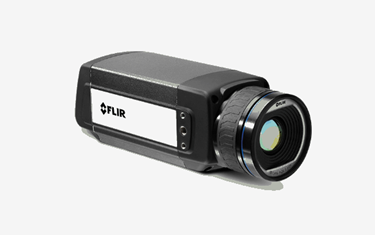 Perfect for Research & Development and Scientific Applications – FLIR’s High Resolution LWIR Scientific Grade Infrared Camera helps you to see and accurately quantify heat patterns, leakage, dissipation, and other heat related factors in equipment, products, and processes in real time. The affordable, compact and powerful A655sc Series provides over 300,000 pixels of accurate temperature measuring data. With its uncooled microbolometer detector, the A655sc series is maintenance-free and provides excellent longwave imaging performance and high-resolution. The 640 x 480, 17 micron pixel detector provides great image detail and small spot size for accurate measurements of small temperature anomalies. The full frame rate feature provides 14-bit data up to 50 frames per second at full frame 640 × 480 resolution. FPA windowing provides high-speed windowing modes (up to 200 Hz with a 640 × 120 window) and digital control of image flow and recording to FLIR’s R&D software. With both GenICam and GigE Vision protocols, the A655sc Series is ready to integrate with a variety of third-party analysis software packages. Download the brochure for more information on High-Resolution Science Grade LWIR Cameras from FLIR, or visit the FLIR A655sc.